Lucy Bartholomew, true to her joyful spirit, hops the finish line at Western States in a time of 18:59:45. 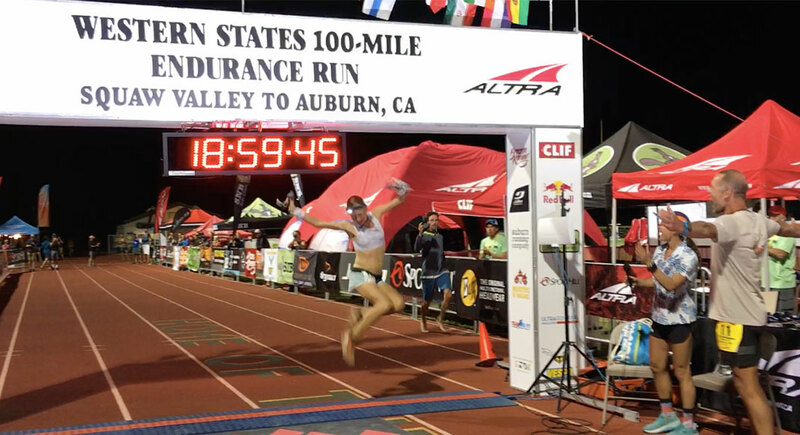 2018’s Western States 100-Mile Endurance Run will be one for the history books—and not just because Jim Walmsely finally broke the men’s course record. Courtney Dauwalter, 33 (find her interview with Trail Runner before the race here), ran 17:27:00, winning the women’s race and setting the second-fastest women’s time in Western States history, beating Anne Trason’s historical 1994 time (17:37:51), by over 10 minutes. Ellie Greenwood still holds the women’s course record with a time of 16:47:19, but it’s worth noting that she ran it in great racing weather—for the first 40 miles, the temperatures danced around 40 degrees. This year, the typical Western heat was out in full force, with recorded temperatures well over 100 degrees on the course. On her first WS 100 race, Dauwalter set a new precedent for running in the heat, placed 12th overall and bested the most competitive field of women she’s ever competed with. Dauwalter lives and trains in Golden, Colorado, and quit a teaching job a few years ago to see how far running full time could take her. So far it is going quite well. Dauwalter was followed by a talented field of women, beginning with Kaytlyn Gerbin, 29, of Issaquah, Washington. Gerbin started running in college and fell in love with trail running a few years later, running her first ultra in 2014 at 25. She balances her training and races with her full-time job as a bioengineer. Gerbin raced Western States for the first time last year and left feeling like she could have done more, despite her impressive fourth-place finish. This year she left it all on the trail, running 18:40:19, becoming the second female runner and 18th overall. 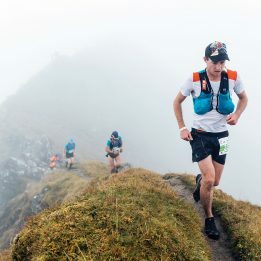 Nineteen minutes behind Gerbin was Lucy Bartholomew (18:59:45), 22, a young Australian from Melbourne who ran her first ultra at age 16 with her dad. At 18 she left college to take some time to race, and hasn’t returned to school (or a career outside of running). 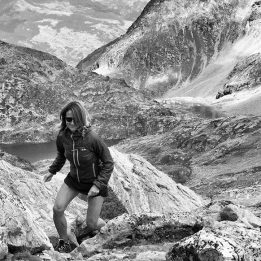 Western States was her first 100-mile race, and she took it out fast, leading the race within the first few miles, much to the chagrin of the many people who told her to go out conservatively. Although Bartholomew paid for her eager start later in the race, she admires the Walmsley-esque, pseudo-suicidal approach to racing and doesn’t regret putting it all out there. After all, she still walked away from her first 100-miler with a 3rd-place finish, 20th overall. Amanda Basham, 28, of North Logan, Utah, rounds out the top four women with a time of 19:17:59 and an overall placement of 22nd. Basham was a cross-country and track athlete in college and started running ultras seriously in 2013. Basham keeps busy as a professional runner, coach and production assistant for a health and fitness company. She ran Western States in 2016, also placing 4th, and DNFed in 2017. If her race history is any indication, we can expect to see her back on the starting line next year as well. Finally, we’re checking in with Lauren Pearch, 33, who Trail Runner interviewed before the race for a look at the buildup to Western States for runners who aren’t internationally known but are still coming on strong. When she’s not running, Pearch works full time as a pediatric-intensive-care-unit (PICU) nurse, and applied to Western States five times before finally gaining entry into the mythic race. She finished 45th out of 60 female finishers, with a time of 29:02:03. When you were out there running, who was with you (in spirit and in mind, more than literally)? Oh, gosh, when the race is so long there is plenty of time for many people and experiences to enter my mind and make me smile. Mostly, though, I carry my family with me. They have been my biggest supporters since I jumped onto this ultrarunning ride in 2011—traveling and being ready to pace or crew me in races, recording jokes and messages that my husband snuck onto my iPod so I could hear their voices in the middle of a race, and being examples of people who work hard and never settle for less than their absolute best. Do you run in your head or in your body? The physical and the mental piece of running are both really important to me. Physically, I train to prepare my muscles and my legs for the constant motion of running. The mental piece, though, is what really gets me to those finish lines as quickly as possible. Our brains are so powerful and, if we use them to our advantage, can help us overcome a whole lot of physical pain. What is your advice for young athletes? To athletes in general, male or female, young or old: believe in yourself, don’t make excuses, put in the work and soak it all up. Whose finish was the most inspiring for you? Every single person out there has an inspiring story, which is one of the reasons I absolutely love seeing people come into the finish. Particular people who inspired me were both Jim Walmsley and Courtney DeWaulter— Jim’s 14:30 on this course is just incredible, and Courtney absolutely crushed it with the second-fastest women’s time in course history. Nick Bassett and Diana Fitzpatrick also both pushed the boundaries of what is possible with their age-group performances—I hope to be running 100s that strongly when I’m their age! Do you take inspiration/courage from work? I do. I apply lessons learned from work to running and vice versa. A lot of my job is about problem solving, and I apply that to my racing. It’s not always easy to balance work and training, but I’m ambitious in both of these aspects of my life and I find ways to make it work. I draw a lot of inspiration from other runners who are balancing work, family, training, etc., whether they’re athletes competing at a high level or athletes that are just excited to finish their goal race. What does running feel like to you? An escape. Running down a ridgleline on cruisy singletrack may be one of the most freeing feelings ever. It’s those moments where you don’t think about other stresses in your life, and it’s just you and the trail. If you could sum up your experience in five words, what would they be? You are stronger than you know (OK, that’s 6). 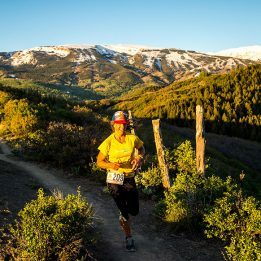 Do you want to run Western States again? Hell, yeah! I am hoping that next year my dad’s name will be pulled out of the lottery (he has been trying for five years), and we can share this trail together. Running to me is mindless, it’s a meditation that makes me realize what’s important in my life. It’s a time in my day where I am not needed, I am not judged and I am free. I think it is the most powerful and raw form of self care and self love. People don’t care if you don’t finish first in the race, they just want to see you give your best. I wore my heart on my sleeve out there at Western States and people respected that . You were super excited about Rucky Chucky [the iconic river crossing]—how was it? My expectations of the race paled in comparison to the actuality of Western States and Rucky Chucky was really no different. I certainly didn’t expect to be hitting the river as late as I did but the run along the river was surreal. For a few miles, there was nothing but the sound of the river to our right and the shadow of the mountains cast by the almost-full moon to our left. Then, suddenly, the aid station glistened in the distance and you could hear the volunteers helping the runners across. It was a peace and silence that was so dissonant to the cruelty of the canyons earlier in the day. Magical. Sacred. Surreal. Inspiring. Hot. I needed Western States to prove to myself that I was tough enough to run the hundred distance. On that day, I didn’t need a silver medal or a top-10 finish; I just needed the support of my tribe to see me to the finish. At 29 hours, I milked that course for everything it was worth. Once I let go of my expectations, I owned the day and it felt good. Bring Out the Black Loop!